I love it when big things happen locally to me. The Admiral Theater in West Seattle is proud to present the only Seattle theatrical premiere of FREEDOM, the jolting new documentary that takes a hard look at America’s perilous and unsustainable addiction to foreign oil on Saturday, August 6th at 7 PM. The documentary, which focuses on a surprising solution to America’s oil dependence, is from the filmmakers of the award winning Sundance documentary FUEL. I plan to attend and I am partway through FUEL, available to stream on demand on Netflix. The Freedom Bus has a 30 city tour planned. FREEDOM features an eclectic array of personalities, including former Speaker of the House Newt Gingrich, former NATO commander Wesley Clark, singer/songwriter Jason Mraz, (who scored the film), international author Deepak Chopra, and such “green” actors as Ed Begley, Jr. (seriously one of my favorite people!! ), Amy Smart, and Michelle Rodriguez. FREEDOM invites audiences to not just get mad, but to get motivated, offering serious fuel for thought for empowering people with knowledge and inspiring social change. The film explores the role that Ethanol plays as a homegrown alternative that will boost the domestic economy, create jobs and reduce our need to rely on dangerous and unstable parts of the world for our fuel. There is widespread agreement that America needs to wean itself off oil yet Ethanol has become a lightning rod of controversy. An anti Ethanol coalition made up of both big oil and radical environmentalists stokes the fires of that controversy every day. Debate rages on the pros and cons of Ethanol but what is the truth? Both Josh and Rebecca Tickell will be available after the film for an audience Q&A. Tickets are $10.00 for the exclusive screening and can be bought at the Admiral starting Friday, August 5 or through Brown Paper Tickets. Or donations can be made at the door. You can RSVP for the event on Facebook here. FREEDOM is a Green Planet Productions release. 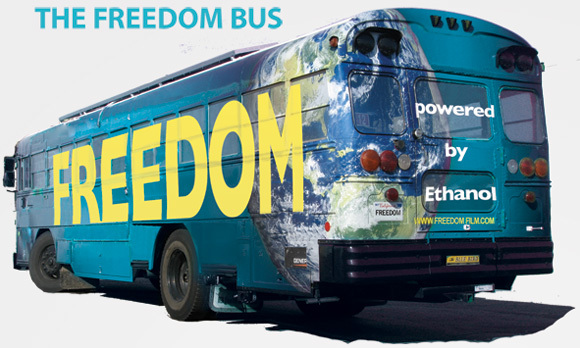 More information on FREEDOM, its theatrical release, its DVD release, and the North American Clean Energy Tour may be found here. Today, building an eco-friendly home requires much more than just installing extra insulation in the attic. There are literally thousands of eco-friendly products and building options out there to choose from and while daunting, all will deliver improved home efficiency and a unique home that could appreciate beyond standard properties. In general terms, the best place to begin is to hire an architect. They should be able to articulate the features you’d like integrated into your property, in addition to providing a clear direction for prime and sub-contractors to follow as the home addition is built. Once permits are secured, source a builder that knows local building codes, but is also a specialist in building eco designs. While in high demand, eco homes are still in their infancy, so be wary of builders who claim to be an expert in everything. Choose a site that maximizes sunlight. This will help heat your home during the winter and provide an excellent charge for solar paneling. Also, if possible, position your home near deciduous trees whose bloom will shade the house in summer. Choose building materials such as bricks or siding for their insulation as well as durability. Select energy-efficient lighting options including “day-lighting” such as skylights to minimize energy use. Also consider building in timing, dimming and motion detectors that will turn lights on and off when areas in your home are not in use. Consider having “structured wiring” installed for Smart Home options that enable one-touch (‘smart climate’) light and heat control. A southern facing roof topped with solar panels can heat water, generate electricity and, in some locations, direct surplus electricity back to the electric grid which could earn you credits or additional income. Ensure your insulation will be at R-2000 standards, including R-50 attics, R-25 walls and R-20 basements. Consider the new, micro “combined-heat-and-power” (CHP) unit furnaces that not only heat your home but can also generate up to $800 worth of electricity per year. These can run $13,000 to $20,000, yet you should be fully reimbursed in about three to seven years depending on the cost of electricity. If the CHP furnace is too expensive, consider a heat pump that can deliver energy-efficient air conditioning and heating capabilities. Finally, check out local and national government “green” programs that may assist you in the purchase of your eco-friendly products through rebates or discount programs. Undoubtedly, there will be choices galore while building your new home. However, be sure the ones you select are ones you need and they will deliver tangible benefits to you, the environment and eventually, potential buyers. As a real estate professional I really focus on saving people money. I am proud to be a part of Better Homes and Gardens Real Estate, which is putting an effort into their Green Leadership Initiative. Try out our interactive Home Efficiency Audit Tool, brought to you by Lowe’s. Learn how you can save money by making your home more efficient by using this online audit tool. Projects are broken out into everyday energy savers, conservation tip, weekend projects and big payoff projects. Scroll down to the “Live Green” section at the bottom of the page to learn more. The High Point Farm Stand officially opens Wednesday, July 13, offering fresh organic produce picked right from the High Point P-Patch Market Garden. Located at 32nd Ave. SW and SW Juneau St, the farm stand will be open every Wednesday through September from 4 pm to 7 pm. Fresh right now is spinach, carrots, leafy vegetables, new onions, peas, turnips and radishes, to name a few. Seattle P-Patch Market Gardens is a partnership developed with the community by the P-Patch Community Gardening Program in collaboration with the Seattle Housing Authority and P-Patch Trust to support low-income gardeners. Its mission is to establish safe, healthy communities and economic opportunity through Community Supported Agriculture (CSA) and farm stand enterprises. If you want to be able to walk to a local farm stand and buy fresh vegetables when in season, click to see High Point homes for sale and then call me for a personalized and detailed tour of the wonderful Built Green Certified community of High Point in West Seattle.